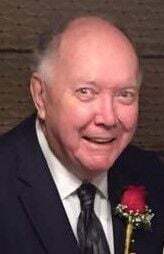 Jack E. Forrest, age 81, of Murfreesboro, died Monday, March 25, 2019 from injuries received in a house fire. He was born in Pine Bluff, Arkansas, a son of the late Euel Floyd Forrest and Mildred Rebecca Valentine Forrest. In addition to his parents, he was preceded in death by a brother, Phil Forrest, and a sister, Ann Brewer. Survivors include his wife of 52 years, Carolyn Forrest; their children, Edward Forrest of Murfreesboro, Kimberly O’Neal and husband Steve of Lebanon, TN, Nathan Forrest of Las Vegas, Nevada, Micah Forrest of Murfreesboro, and Rachel Forrest of Nashville, TN; three grandchildren, Stephen, Kevin, and Marcie O’Neal; several nieces, nephews, cousins, and a host of other loving family and friends. Dr. Forrest was a faithful member of Forest Hills Baptist Church. He was an ordained deacon and taught Sunday school for many years. Most recently he taught Sunday school at the Arabic Baptist Church, Murfreesboro, TN. He was a United States Air Force Veteran serving during the Korean War and was a 1955 graduate of Little Rock Central High School. He worked as a lineman for Southwestern Bell during college. He was a graduate of the University of Arkansas where he received his BBA, MBA, and PhD degrees. His career spanned many years, teaching thousands of students at the University of Arkansas, MTSU, Belmont, Cumberland, Martin Methodist, and Trevecca Nazarene Universities. Jack was a devoted Christian, husband, and father who loved his family and friends. He was a Godly man who accepted a servant’s role as the head of his household. He will be fondly remembered for his love for the Lord Jesus Christ, the church, his family and friends, Arkansas Razorbacks, his deep conversations, his wisdom and keen sense of humor. He loved photography in his younger days and kept his family up to date on genealogy and family history. He delighted in his library of family pictures and frequently posted them on Facebook. He enjoyed cooking and made a delicious squash casserole and pineapple upside down cake. In his honor we will continue to have his favorite frozen fruit salad at family gatherings. Jack often reminded us that “God has prepared me for this moment”. Visitation with the family was Friday, March 29, 2019 from 10 a.m. until the time of funeral services beginning at 12 p.m. at Forest Hills Baptist Church, Nashville with Dr. Sam Boyd officiating. Burial was 1 p.m. Sunday in the Forrest Family Cemetery near Brownsville, Tennessee with family serving as pallbearers. Memorials in memory of Dr. Forrest may be made to Forest Hills Baptist Church, the Arabic Baptist Church of Murfreesboro, the building fund at Barton’s Creek Baptist Church in Lebanon, Global Accord (From Ashes to Glory Ministry), and the Belonging Company in Nashville.